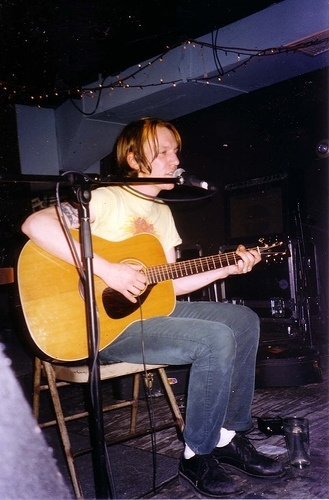 Elliott Smith at his last-ever NYC show, January 29th 2003. He killed himself that October. I have this friend, let's call her L. We "met" on a music messageboard back when things like that were still popular. We lived in different cities and we never met in person, but we both loved music. She introduced me to a bunch of artists I'd never otherwise have come across. L lived a complicated life. She suffered eating disorders, self-harmed to a quite terrifying degree, and was in and out of rehab centres. She was also a brilliant artist: a writer skilled with words and meaning and an expert with sketching, painting and textiles. This was reflected in the music she loved. Elliott Smith was one of her favourites. I first learned how to properly spell his name after she painstakingly corrected me in late-night music discussions over MSN Messenger. She loved "Needle in the Hay", perhaps Smith's most famous song, as featured in The Royal Tenenbaums, which meant that this became the first of his recordings I ever heard. Other artists captured her personal mixture of the tragic and beautiful: Xiu Xiu were another of her favourites. I could never warm to Jamie Stewart's heartwrenching pain and the sparse and uncomfortable soundtracks. Elliott's simple and unpolished aching, his open, bare outlook and sometimes joyous uplifts in spirit were something I could engage with, for a time. He killed himself not long before I first became aware of him. I remember L telling me the story and wonder now if she understood a little of what he felt, while to me it was just another glamorous, mysterious dead rock star, joining the immortal ranks of Cobain, Vicious and Edwards. His gentle, lulling chords and angry, passionate yelps might have spoken to her with the depth and reach that Elliott's songs often reached for his most devoted followers. I learned to play a few of his songs and recorded shaky cover versions to show her. They weren't great: my voice was weak and nervous and the guitar awkward at times and amateur. But sometimes that was how Elliott sounded: every time I listen to "The Biggest Lie", I marvel at how it begins like an over-eager open mic performer but transforms into a hymn, almost. I copied out the lyrics to "Twilight" on a piece of paper because I didn't have a printer, wanting to perform it somewhere. My dad found the words and thought they were my own. I wonder sometimes what he thought when he read the lines: "haven't laughed this hard in a long time / better stop now before I start crying". I didn't really know then how Elliott felt, though I suspected L did. His music never changed, by then. Unlike other artists whose work you come to late, Elliott's discography was final: an artefact, if you like. Sure, there were demos and b-sides and covers and all the rest. But what he left behind a decade ago this week has remained a constant in my life: the twinkly chords and mumbled verses instantly take me back to L and our long talks and my attempts to understand her world through the filter of Elliott's music. I last spoke to L in the autumn of 2010, three years ago now. I'd just lost a close family member and was feeling, for the first time in my life, some of the emptiness that unexpected death can leave you with. I told her about it and she expressed her shock and sorrow for me. I told her I'd be okay. That was the last time I heard from L. I know she'd been in some kind of recovery or rehab centre around that time, but I didn't know where. I texted, emailed, and after a couple of years, wrote to her a copied letter which I posted to all of the addresses I'd had for her. I did get one response back, from a man who'd moved into her old address. All he could tell me was that she didn't live there any more. It's ten years now this week since Elliott Smith left us, and almost three years since L disappeared from my life. For me, the two are inextricably linked. L introduced me to the music and the tragedy of Elliott Smith's life and work. Elliott Smith helped me understand and cope with the beauty and the sadness of L and whatever path she took. I miss her all the time and I wonder at what happened, but the music that Elliott left us gives me a bittersweet gift. I didn't really know what he meant when he said "because your candle burns too bright / well I almost forgot it was twilight", but I think now I have a little idea. Second Elliott photo by Constintina Trainwreck. Scene Point Blank wrote about Elliott's death the week it happened. You can read our reaction here. 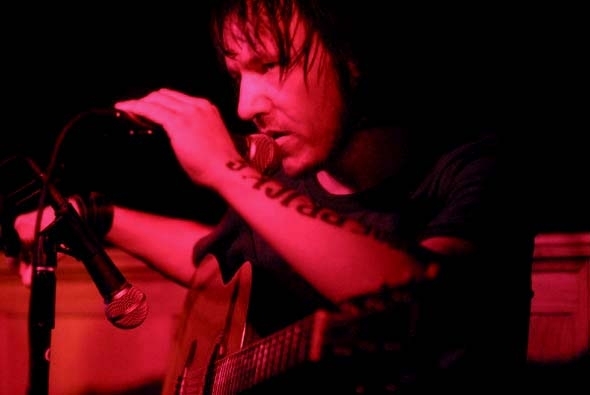 We also compiled a list of the Top 5 Elliott Smith Songs That'll Choke You Up.